Toyota has released its production details for North America for 2018 and the data show an increase in production inside Mexico and a decrease in production in the U.S. and Canada. These figures include Lexus brand models. In Toyota's United States plants, production declined by about 31,000 vehicles. That is a relatively small decrease given that Toyota built over 1.2 million vehicles in America last year. Among all the vehicles sold by Toyota and Lexus in America last year, about half were built inside the U.S.
Toyota's Canadian operations saw a much bigger decline. Production dropped by about 74,000 units on volume of just under 500K units total. In Mexico, Toyota's production increased by about 48,000 units. All due to the increased production of the Toyota Tacoma pickup truck. Toyota must build its pickup trucks in North America due to the 25% import duty on trucks imposed by President Lyndon Johnson in the 1960s and kept in place by every American President since. However, automakers can build trucks in Canada or Mexico, and other companies besides Toyota do build "American trucks" outside of America. Notably General Motors and Ram. Toyota has been adding capacity overall for the Tacoma, which leads its segment in sales. Toyota now builds more Tacomas in Mexico than it does in its Texas plant. Production of the subcompact Yaris models Toyota produces in a Mazda plant dropped by about 4,000 units ( and we included that in our total increase above). In 2017, Torque news predicted the percentage of Tacomas built in the U.S. would decline and that Mexican-built Tacomas would reach more than 50% of production. We asked our readers, "Will 2017 Toyota Tacoma Being Mexican-made Matter to Buyers?" Comments under the story were almost unanimous in saying that the commenter would not buy a Mexican-built Tacoma. The answer, at least according to increasing overall sales, has been "No, it does not matter." It should be noted that although we have detailed the production in North America, Toyota does sell some of its North American production into Canada and into Mexico. Although most automakers consider North America one market for production, sales are reported by every manufacturer separately for the U.S., Canada, and Mexico. One other interesting fact shown in the data is Toyota's North American green vehicle production, which is 68,103. Toyota also imports many green cars, notably its Prius, the top-selling affordable green car in America. 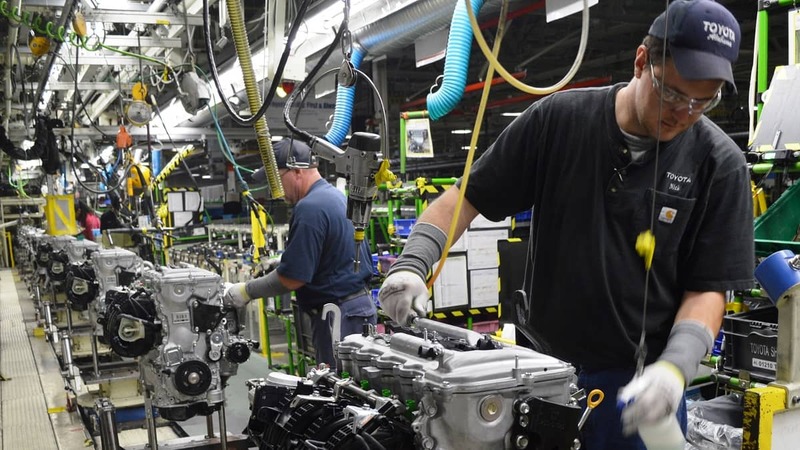 Toyota produces over 1.2 million engines in America in its two plants in Alabama and West Virginia. Toyota also operates a casting plant, called Bodine Aluminum, Inc., in Tennessee and Missouri, which casts aluminum engine blocks, cylinder heads, and engine brackets; Toyota Auto Body California (TABC), Inc., in Long Beach produces stamped/welded parts and steering columns. These component builds are not part of the above vehicle production summaries.